ACM Live is this week, June 27th 11:00 am – 2:30 pm EDT. You can register for the event by clicking here. During ACM Live, Nathaniel Palmer, WfMC Executive Director and Industry Analyst, and Keith Swenson, WfMC Chairman, will take a deeper look at Adaptive Case Management (ACM) and the impact it is having on organizations. In the past software tools for the enterprise have focused exclusively on the process, but today organizations needed better solutions to manage the complex set of collaborative activities involving both human judgment and system interactions that are much less structured and predictable. What’s needed is a solution that not only supports this new pattern of work, but also improves how an organization uses information to make better decisions. 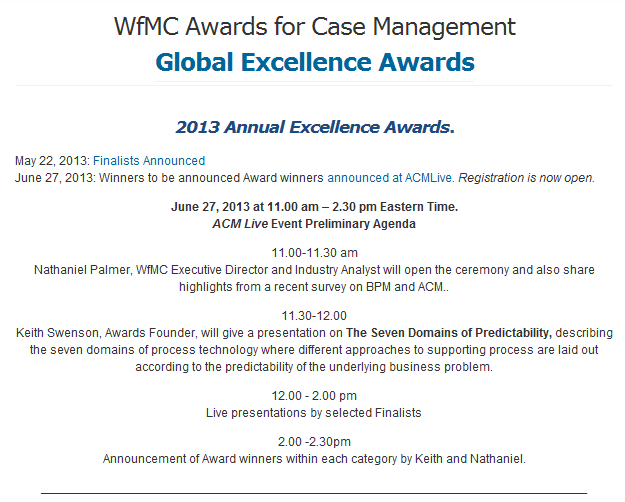 ACM Live will also feature the announcement ceremony of the 3rd Annual Global Excellence in Case Management Awards at 2:00 pm EDT. There are several finalists including Department of Transport South Africa, an EMC Documentum xCP customer. 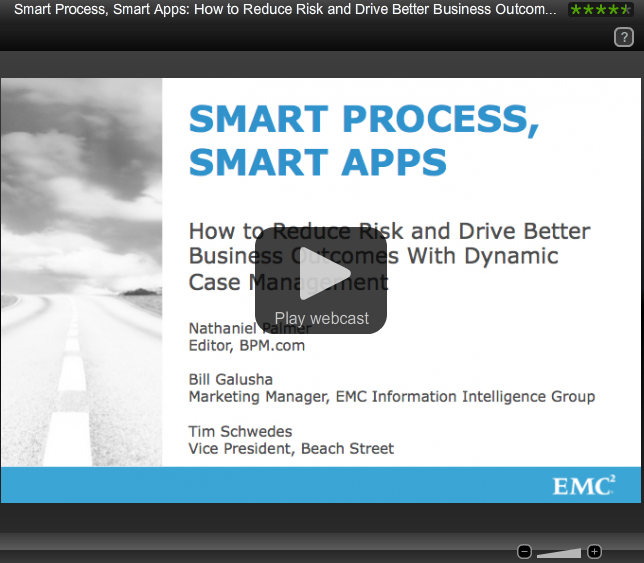 I recently finished up a Webcast on dynamic case management with BPM.com and Beach Street, an EMC Partner. This Webcast showcased EMC’s approach to case management as well as a live demonstration of the new Beach Street Contracts Lifecycle Management solution. You can watch the recording by visiting the BPM.com site.